b. August 31, 1932, Lebanon, New Hampshire, USA. Alanis Obomsawin has become, perhaps, not only Canada’s most famous indigenous filmmaker but also one of the more well-known Canadian documentarians. Her work, like that of the National Film Board’s (NFB), is designed to show aspects of Canada not regularly seen. Obomsawin, however, subverts this ideal in the sense that her films are not necessarily made for all Canadians. That is to say, her films are made primarily, at the levels of both production and reception, with first-nations people in mind. English and French Canadians are, for the most part, reflected only in terms of governmental policies and actions that directly affect the indigenous people presented in her films. Obomsawin’s films are also significant in the sense that they are perfect examples of Third World filmmaking within the First World. They reflect the need for change in how the First World treats its indigenous peoples. Her films also reflect a rejection of First World film styles and aesthetics in favour of a more reflexive style which compels the viewer not only to actively deconstruct the issues being discussed but also the filmmaking style they are presented in. Her films are subjective in the sense that they are made for her people (indigenous people), and it is such a subjective style that reminds the viewer that her films are not only about her people but by and for them as well. Jerry White states that “Obomsawin’s films embody the very essence of a Griersonian ethic of filmmaking”. (1) White’s statement reflects the fact that Obomsawin’s films are socially conscious and reject all the pitfalls of commercially driven cinema, which is the ideal John Grierson (the first head of the NFB) believed Canadian cinema would someday embrace/achieve. Obomsawin’s films, however, also counter “the NFB’s exclusion of native subjectivity” (2) made apparent in such NFB films as Colin Low’s classic Circle of the Sun (1960). Low’s film about the Blood Indians of southern Alberta, while beautifully crafted, is made by and for English Canadians with the native voice reduced to a running commentary of images of the Bloods’ performing certain rituals. Obomsawin’s subjective style is what makes her films so important simply because they are about her, and her people, supplying her own images and commentary. The purpose of the first part of this paper will be to examine Obomsawin’s subjective style in terms of how it relates to a Third World filmmaking aesthetic within the First World. This will be done by examining the native voice (frequently Obomsawin’s own), as well as her interviewing techniques and how they differ from those techniques used in conventional documentariy filmmaking. Obomsawin’s use, or manipulation of, historical and media photographs to develop the narrative of her films will also be examined. The second part of this paper will focus on how Obomsawin constructs an identity for all first-nations people without speaking exclusively in terms of geographical boundaries but still staying within those spaces. Obomsawin’s Incident at Restigouche (1984) is an excellent example of her use of the soundtrack as a tool to give the viewer a sense of the injustices being committed to first-nations people. I am speaking not only of the voice in Incident but also of her use of sound effects and music at particular points in the narrative. Incident begins with a photograph of a line of men, who I believe are officers of the Quebec Provincial Police, raiding the small Micmac fishing community of Restigouche. As the animation camera pans the still image from left to right we hear sounds of marching feet accompanying the photograph of the police. Obomsawin cuts to an interview (presented in medium-close-up) with a native man (who participated in the defence of his community) as he describes his and the police’s actions at the beginning moments of the raid. Obomsawin then cuts back to the same picture of the police, this time to the tune of a Quebec folk song; the sounds of marching feet in unison with the beat of the song. After this sequence there is a quick cut to an interview with the Fisheries Minister of Quebec (presented in medium shot) saying that, due to the nature of the differences between the “whites” and the “natives” of Canada, violent conflict is sometimes unavoidable. Following this dismissive remark, Obomsawin cuts to a map of Canada, the camera slowly zooming into Restigouche Quebec, with Obomsawin’s own voice quickly explaining the history, and nature, of the conflict between the Restigouche community and the province of Quebec. In this voice-over, Obomsawin relays that as the Micmacs were pushed off their land hundreds of years ago, they had many restrictions placed on their hunting practices as well. She states that attempts to undo this injustice are just now being debated and, as the frame is now firmly centered on a graphic of the coastal village of Restigouche, she then cuts to the opening title sequence. So, what has Obomsawin accomplished with this opening sequence (which lasts exactly 1 minute and 57 seconds in a 45 minute-plus documentary)? And why is the soundtrack so important? Well, Obomsawin gives the viewer a very quick, and very effective, portrait of the clashes between the villagers of Restigouche and the government of Quebec, and she has completely slanted the argument to the side of the fishermen. So, before we have even reached the title sequences of Incident, we are on the Micmacs, and her, side. We have formed an opinion of both sides of the argument and this opinion is supported by every subsequent image seen on screen and every subsequent sound heard on the soundtrack. The soundtrack is so important because it takes images, some of which are constructed by impartial third parties, and reinterprets them by adding layers of sound that provide meaning not necessarily apparent in the images themselves. Adding the sound of marching feet to a photograph of provincial police, in the act of marching, provides a sense of movement that is not there in the photograph itself. The photograph takes on a new meaning in the sense that the movement is inferred though not actually visually experienced. An inferred action can subsequently take on more importance than an apparent one because it requires the viewer to “fill in the blanks” between the images. That is to say, if we are presented with a photograph of police marching and then subsequently presented with a photograph of a policeman holding a native by the hair without the sound of marching feet presented with the images, they then become two separate images. The sound of marching feet connects the shots into a linear narrative of inferred actions. The advantage of using still photographs accompanied by the soundtrack, is that the viewer gets a sense of inferred movement while also being able to separately contemplate each image in the midst of a developing narrative. A collage is at work here, but one that is strengthened (linearly speaking) by a continuous soundtrack which connects the photographs. The last sequence before the opening title credits consisting of the map of Canada, presented in center frame, with the camera moving in on a graphic of Restigouche and Obomsawin’s voice on the soundtrack, simply strengthens her position by giving the viewer a subjective analysis of the conflict and eliminates any ambiguity as to whom this film will focus on. We now know that this will be the story of the native fishermen of Restigouche’s struggle against the oppressive provincial policies of Quebec. How does this style support a Third World aesthetic in the First World? 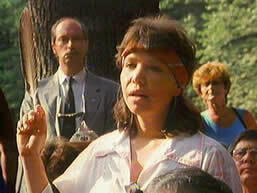 The aforementioned speech made by Obomsawin herself is an example of epideictic rhetoric. According to Steven Leuthold, this kind of rhetoric “is used to fix praise or blame and rehearse communal values”. (3) Leuthold points out that one danger in using this typically “Western explanatory framework upon other cultures’ communication forms is that it can lead to ignorance of the special qualities of those cultures’ practices”. (4) Applied to Obomsawin’s case, her speech leads to a condemnation of Western practices by using their own oral traditions against them. This tactic becomes a case of the colonized using the master’s tools against him. This time for expression is so important in terms of Obomsawin’s subjectivity because these are people whose voice is usually confined to specifically configured soundbites on national news programs. White concurs that “this uninterruptedness is an especially important part of her form, actually, because it is a way of slowing these films down (people are allowed to finish thoughts, even when they are awkwardly phrased or take a long time to get out)”. (6) White points out that the fact that “her films feel a little slow and rambling and formally very pared down is a testament to how little conventional documentary really does this”. (7) White’s argument is equally relevant to the case of the Third World filmmaker as outside the norm of cinematic practices of the First World. This notion of Obomsawin possessing an uncommon style within the documentary model is essentially what Third World aesthetics is all about (in the sense of a refusal to perpetuate the mainstream practices that have relegated the Third World to the edge of international prominence in the first place). This practice differs from similar tactics used by the B-unit of the NFB (e.g. Terence McCartney-Filgate’s The Cars in Your Life ) or a Marcel Ophüls film (e.g. Hotel Terminus: The Life and Times of Klaus Barbie ) in which the subject is interviewed for hours until he says something really stupid. In Obomsawin’s films, the native subjects are treated very patiently simply because they have a lot to say about the emotional complexity of being a first-nations person in an inherently racist system. My favourite parts of many of Obomsawin’s films consist of her ingenious use of animation cameras on historical and media photographs. At the time of writing this paper, no films come to mind in which Obomsawin has not used this technique. I believe there are at least two reasons for this technique: one is a need for images directly related to the narrative that are not available on film (thus using an animation camera to give the illusion of movement), and the other is to take the images that the mainstream media uses and reinterpret them to conform to a Third World aesthetic. Since the former reason is born from necessity, but nevertheless ingenious, I find the latter much more interesting in terms of the topic of this paper. For instance, there is a particular photograph in Incident that perfectly illustrates this point. The photograph is an image of a native man, soaking wet from hiding in a river (as the narration informs us), handcuffed and being escorted by two police officers to an as yet undisclosed location. 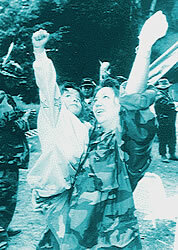 For the first few seconds, we are shown the photograph in its unaltered form, which is a typical media photograph, with all participants framed in an impersonal American medium-shot (from the knees up). Obomsawin then begins to play around with the image by first zooming into a close-up of the native man’s shackled hands, and she then cuts back to a medium-shot of the photograph and performs another similar zoom, this time to a close-up of the native man’s face (looking absolutely miserable), and she then moves onto the next image. What Obomsawin has accomplished with this sequence is a successful reinterpretation of the original image. While most English and French Canadians who, upon seeing this photograph would quickly scan it and interpret it in terms of our existing schemas about why most people are taken into police custody (i.e. breaking the law), Obomsawin takes this same photograph and focuses our attention on the psychological characteristics of the native man, thus counteracting the effects of the superficial signifiers that this type of photograph usually relies on the viewer possessing. This type of filmmaking is significant because it not only challenges our ideas of what is happening in the immediate situation but also challenges the way in which we interpret the mainstream media’s images. 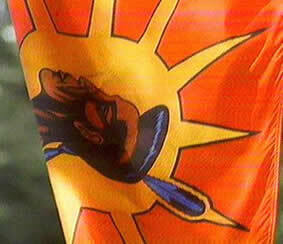 Obomsawin’s use of historical photos in films such as Spudwrench is just as significant but in a different sense. A significant portion of Spudwrench depicts the history of native iron workers throughout North America, who laboured to connect, and develop the infrastructure for, the many spaces within the continent. Obomsawin takes many very old photographs and film/newsreel footage, originally intended to depict the mammoth structures of manmade landmarks such as bridges and skyscrapers, and focuses our attention, instead, on the natives who built them. For instance, in many photographs of bridges being constructed, Obomsawin will start with presenting these images in their entirety (e.g. a segment of a bridge being hoisted into position by a huge crane) and then zoom-in to a specific part of the image not easily seen (e.g. a native iron worker, dozens of feet in the air, securing the connection between that section of the bridge and the crane). This use of the animation camera can not only present the viewer with an exhilarating realization that forces him/her to gasp “My God, is he really hanging from that bridge by a rope?” but it also allows for a metaphor to be inferred in the sense that this photograph represents the indigenous person hidden in Western history. None of us, or at least not many of us, are aware of the native people’s contribution to the development of North America’s infrastructure. Obomsawin shows us, however, that the evidence is there if we just focus our attention on the smaller details. It is significant, though, that she is willing to help us take the first step. Leuthold has argued that there is a tradition for this in ancient indigenous narrative forms such as “historical hide paintings, winter counts and ledger drawings”. (8) He goes on to say that, similarly, “native documentarians often rely on historical stills, film footage and paintings of historical events to convey content”. (9) Obomsawin takes this concept one step further, in a sense that Leuthold does not account for, by reinterpreting these photographs into a narrative format consistent with her theme of using images to convey the native, not the North American (Western), experience. Figuratively speaking, Obomsawin does not let the photographs speak for themselves; she infuses them with speech. In the last section of this paper, I will discuss how Obomsawin structures the concept of indigenous identity within her films. Obomsawin seems to frame this concept of identity in two ways. The first is a tendency to develop a strong sense of place in terms of a physical space where her films and her subjects are situated. That is to say, in most of her films, Obomsawin presents the viewer with a strong sense of where these native subjects consider their home to be. The second way in which Obomsawin frames this concept of identity is apparent in the way she challenges the concept of community. While most characters in her films absolutely look to one specific area as home, they may not live or work in that area nor visit it very often. In examining Obomsawin’s practice of establishing a strong sense of place, the most effective example is apparent within the aforementioned opening sequence of Incident at Restigouche. Earlier, I mentioned a shot of a map at the beginning of the film but only examined it in terms of the voice accompanying it. Now I shall discuss the map itself. The map-shot, within this remarkable opening sequence, begins with a map of the Western Hemisphere (not divided into borders) which then dissolves into a bordered map of North America. The first movement the camera makes within the map is significant because that seeks to divide the map into spaces of relevance for this narrative. So, the first movement occurs with the camera slowly panning up and eliminating America from our view (this will be a story within a Canadian space). The next movement consists of a rightward pan that then removes Western Canada from view and brings Eastern Canada into prominence (so this is not simply a Canadian story). The camera then zooms in on the province of Quebec, priming the viewer to think that this film will occupy a French Canadian space, but just as Quebec becomes centered, the frame performs a dramatic 45 degree tilt to then center on Quebec’s southeastern Atlantic coastline. The image dissolves and then zooms into a small section of that coastline, now divided into separate villages and communities, with the camera finally resting on a centered dot marked Restigouche. The obvious benefit for this sequence is its remarkable effectiveness as an establishing shot whilst also serving as a signifier for the community’s characteristics in the sense of a geographical marker. John Collier Jr. has written that “mapping and surveying increase the dimensions of detail–and enable us to relate ecology definitively to culture, social structure, and technology”. (10) In other words, by presenting Restigouche as an image on a map, the viewer can then add geographical signifiers to his/her ever-increasing knowledge of the village of Restigouche. We realize that Restigouche is a coastal community which tends to signify a fishing community, and this primes us to think about the typical characteristics of a fishing community. It is also significant that Obomsawin presents Restigouche to us with a series of slow camera movements, which slowly eliminate the space within which this story will take place, but also allows the viewer to develop a sense of off-screen space that will serve to firmly place Restigouche within a geographical space within the Western Hemisphere. Obomsawin has now presented the viewer with an example of a third world space within a first world space. This sequence has also presented the viewer with a solid understanding of what these native fishermen consider to be their home and a slightly better understanding of what that home is. Applied to the case of Randy Horne, Gabriel’s argument rings a kind of somber note in the sense that, for Horne, his sense of home is the third space of passage rather than an actual, physical place. So, in a way, even when Horne is climbing the scaffolds of the skyscrapers of New York City, he is as at home as he ever will be. 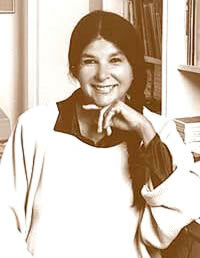 Alanis Obomsawin incorporates a Third World aesthetic into all her films. Her aesthetic consists of taking images from the First World of the Third World and reinterpreting them as Third World images of the First World. This aesthetic is accomplished by adding layers of sound to first world images, as well as focusing the viewer’s attention on specific aspects of these images allowing meanings to be inferred that were not necessarily apparent in the images themselves. Lastly, Obomsawin’s construction of a third space allows for a unique definition of identity, community, and home in a distinctly indigenous framework, allowing not only for a physical space but also a mindset for the indigenous identity to develop. You can also get more info and purchase her films on this National Film Board of Canada Site. Contains brief bio and two of her films can be purchased here. The rest of the WMM site is also worth browsing. Article is from 2001, but still worth reading. Credits and video clip for this film can also be found here. Press release for the film. Obomsawin receives an honorary Doctor of Laws degree. The Film and Video department. Paul Williams is a recent graduate of the University of Alberta's Film and Media Studies Program based in Edmonton, Alberta, Canada, where he was born and bred. His main areas of interest and research include Canadian Direct Cinema (especially the films of Colin Low), the films of Mohsen Makhmalbaf, and Native Canadian Documentary/Ethnographic Cinema, and he is a long-time devotee of the films of Alanis Obomsawin.